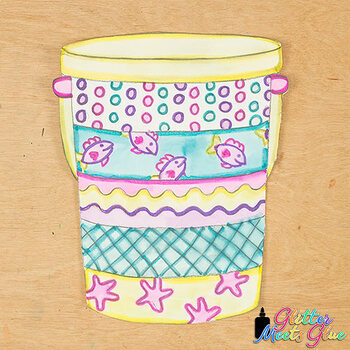 Decorate your bucket filler bulletin board with these creative sand buckets. Fill up your art sub plan folder with no-prep, fuss-free art projects that pair well with other bucket filler activities. Great for classroom teachers wanting to "paint" on a dime using markers like paints but can also work simply using colored pencils, crayons, and markers. 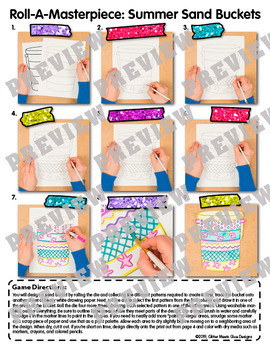 Perfect early finishers activities where students follow a directed drawing handout to create their own sand bucket. 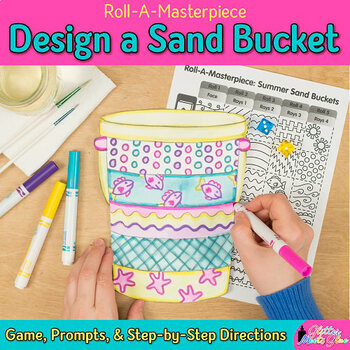 Simply print out the game and picture directions back-to-back, give them dice, and watch them have fun creating their own sand bucket. Once completed, use the writing prompts to connect literacy to your lesson. 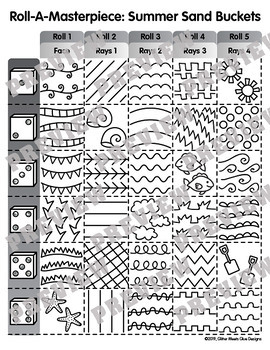 You will design a sand bucket by rolling the die and collecting the different patterns required to create it. First, trace the bucket onto another sheet of heavy white drawing paper. Next, roll the die to select the first pattern from the first column and draw it in one of the areas of the bucket. Roll the die four more times, drawing each selected pattern in one of the other areas. Using washable markers, outline everything. Be sure to outline large areas where they meet parts of the design.